Last month Jay Leno canceled a gig at the gun industry's upcoming trade show, the National Shooting Sports Foundation's (NSSF) SHOT Show, after several advocacy groups -- including the Newtown Action Alliance, based in the town where a deranged person killed 20 children and six adults at an elementary school in Newtown, CT in December 2012 -- brought the NSSF's opposition to even modest gun safety laws to the comedian's attention. Once he learned that his agent had booked him to appear at the gun lobby's event, Leno did the right thing -- he called the Newtown Action Alliance's leader, apologized for the mistake, and withdrew from the shooters' shindig. Now another group -- Moms Demand Action for Gun Sense in America (MDA) -- is calling on two other entertainers, country singer Alan Jackson and comedian Jeff Foxworthy, to snub the gun lobby by cancelling their appearances at the National Rifle Association's convention scheduled for April 11 at the Bridgestone Arena in Nashville. Last week MDA launched a social media campaign to draw attention to the celebrities' NRA gig, hoping to remind them of the NRA's complicity in the deaths and injuries of many Americans due to weak laws and the proliferation of assault weapons. The MDA recommends several tweets to educate the public and the entertainers about the NRA's deadly activities. In its promotional materials for the event, the NRA's website says: "After you've browsed acres of new guns and gear and maybe attended a seminar at the NRA's 144th Annual Meeting and Exhibits in Nashville, TN, there's only one thing left to do: On Saturday, April 11, point your boots toward the Bridgestone Arena and let yourself unwind during an evening of top country music entertainment." But the NRA members will have to leave their guns in their hotel rooms, because the venue for the NRA event has a policy against guns posted on its website: "Guests are prohibited from bringing weapons into Bridgestone Arena and Bridgestone Arena Plazas." This contradicts the NRA's official position of defending the right of Americans to carry concealed weapons in bars, churches, schools, universities, and elsewhere. According to his publicity, Jackson has sold nearly 60 million albums worldwide and ranks as one of the 10 best-selling vocalists of all-time in all genres. Jackson is promoting the NRA on his website. 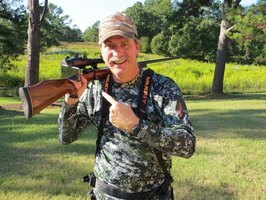 Foxworthy, widely known for his redneck jokes, is the largest selling comedy-recording artist in history, a multiple Grammy Award nominee, author of more than 26 books, and the founder of the Blue Collar Comedy Tour. He hosted several game shows, including three seasons of "The American Bible Challenge" and the show "Are You Smarter Than a 5th Grader." Foxworthy is no stranger to the NRA. 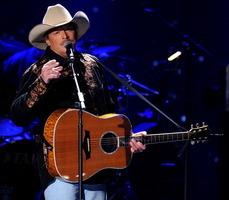 He, along with right-wing musician Ted Nugent, performed at the NRA's 2011 convention in Pittsburgh. Moms Demand Action was founded by stay-at-home mom Shannon Watts on Dec. 15, 2012, in response to the devastating shooting at Sandy Hook Elementary School. The organization quickly became a leading force for gun violence prevention, with chapters in all 50 states and a grassroots network of moms that works on promoting policy changes at the local, state and national levels. One of its current campaigns is to persuade Kroger, the country's largest grocery retailer, to prohibit open carry of guns at its supermarkets. "For too long, those who stand to profit from easy access to guns have controlled the conversation about gun violence," MDA states on its website. American families are being destroyed and mothers have had enough; we will no longer stand by and let Congress, companies and colleges turn their back on sensible gun laws and policies." Moms Demand Action's website points out that 76 percent of gun owners, including 71 percent of NRA members, support prohibiting people on terror watch lists from buying guns, but the NRA opposes this idea. It also notes that thanks in part to the NRA, the FBI has no authority to block firearm sales to individuals on the country's terrorist watch lists. The NRA opposes requiring a criminal background check of anyone purchasing a gun, even though about 80 percent of gun owners, including 74 percent of the NRA's own members, support this common sense approach. You can get more information about Moms Demand Action on its website, Facebook page, and via Twitter (@momsdemand). Peter Dreier teaches Politics and chair the Urban & Environmental Policy Department at Occidental College. His most recent book is The 100 Greatest Americans of the 20th Century: A Social Justice Hall of Fame (Nation Books, 2012).